"Wouldn't want to live here!" The voice of a colleague crackled over the two-way radio, clipped to my life-jacket. White-capped, salty waves whipped up by bone-chilling katabatic winds, slapped the bow of our twelve passenger rubber zodiac, as I steered the motorized craft in the surging seas, towards forlorn and inhospitable Elephant Island. Situated some 240km east of the Antarctic peninsula, in the cold Southern Atlantic Ocean; inky black, jagged volcanic peaks towered over us in the gray skies, as seabirds swooped and plunged around us, in search of their next meal. 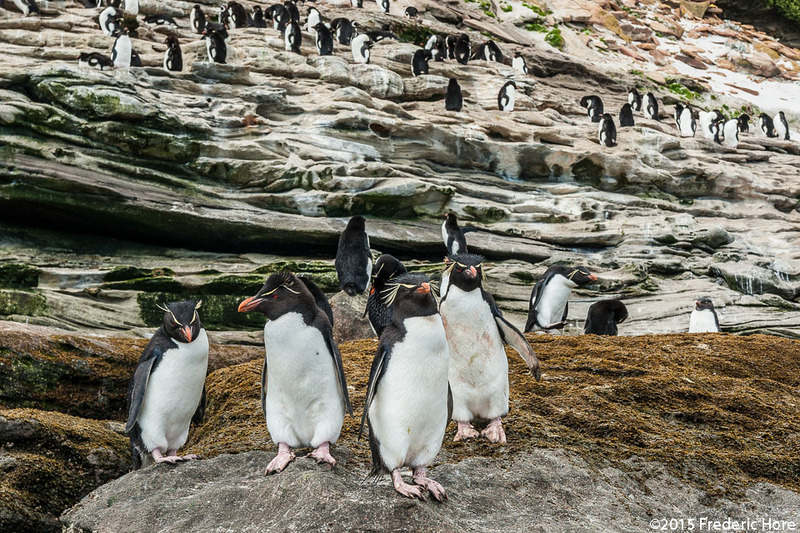 Steeped in history and iconic beauty, we had come to see the colourful, nesting Rockhopper penguins, renowned for their distinctive bright yellow eyebrows; "singing" elephant seals; and ferocious, dueling fur seals, that inhabit the craggy shore. It was here, that famous explorer Ernest Shakelton and his crew escaped to, marooned for several months in 1916, after their two wooden ships became trapped, and were ultimately crushed by pack ice in the Weddell Sea. This show starts with a tour of the secluded harbor town of Punta Arenas, Chile, the historical base for many of the 20th century's early expeditions to this frozen, barren continent. Heading south through the Drake Passage to the Antarctic Peninsula, you will be mesmerized by the huge, tubular icebergs that aimlessly drift in the Weddell Sea; Brown Bluff's boisterous Adelie penguin colonies, and the rugged grandeur of Elephant Island. Next the trip heads north to the Falkland Island archipelago, with extraordinary views of the fauna, flora and birdlife that inhabit the sandy terrain of Seal Island and Saunders Island. Be charmed by young battling King penguin chics, surfing Magellanic penguins, and roaring bull elephant seals! A look at the rustic village of Port Stanley, and a brief overview of the Falklands war is included. Featuring all new imagery, this is a sequel to my first acclaimed show titled The Ethereal World of Antarctica. So join me for the adventure, as I present the history, beauty, natural wonders and stories of Wild Antarctica and the Falkland Islands, in this entrancing 90-minute presentation.